Several weeks ago I tried to wind some sock yarn into a center-pull ball. No directions...how hard could it be? Apparently, too hard. 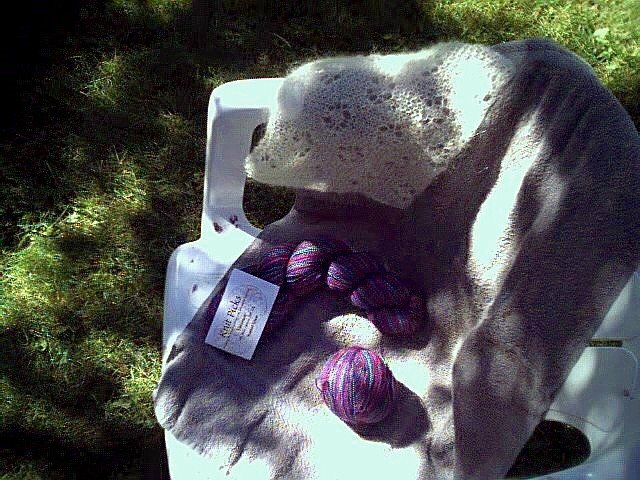 The resulting ball looked great, but several yards into the ball, the yarn refused to come out. So, I tugged and I tugged and I pulled, and POP out came a HUGE snarly tangle. I swear, about half the ball came out! After un-snarling the tangle, and re-winding that half of the ball, I now have two balls of connected yarn, and I'm scared to even think about the whole thing. The writer of the directions mentioned that she liked to use her yarn swift and ball winder when working with lace weight yarn. I don't have either one of those items (nor can I convince the Curmudgeon that we should use the power-bill money to purchase them), and I looked at my two lovely skeins of lace weight yarn and thought "I can do this...these skeins only have 440 yards in them...piece of cake!"). Well, you know how sometimes the more you get done on something, the more there remains to be done? - Or, at least it seems that way? That's how it was with the skein of yarn... I draped the skein over the back of my Mom's old wooden rocking chair, and propped-up the front of the chair so that the back came down to a good height for sitting-on-the-couch-and-winding-yarn. And, following directions (religiously), I began to wind. Approximately 8 hours later (have I mentioned that I sometimes exagerate, just a little) I looked at the remaining portion of the skein still on the back of the chair, and I swear, it had not decreased in size! As you can see in the photos (can you see it?) I did get one skein wound. That's why I may deserve a medal... I'll wait until after my arms and shoulders heal before I do the second one. I am excited to begin my Amazint Lace adventure. I've chosen the "Rosebuds and Climbing Roses" shawl from Lavish Lace by Carol Rasmussen Noble and Cheryl Potter, published by Martingale. 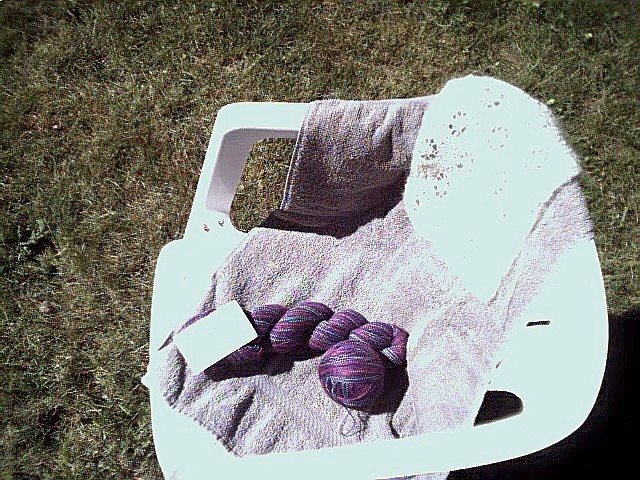 I'm using Knit Picks yarn called Shimmer (70% baby Alpaca, 30% Silk) in the Stained Glass colorway. (And, I'm thinking of using a US size 4 needle.) Both the yarn and the book were purchased here. There's also a small lace sample piece in the above photos, in case you can see it and wonder what it is. It has nothing to do with the Amazing Lace project. I just thought I'd get a picture of it. I did successfully sign up for The Amazing Lace, but haven't figured out how to import the button into my side-bar. And, in yesterday's post, you can see my abortive attempt to import the Lace Ring Button. Even the Curmudgeon couldn't help. I'll keep working on these dilemas. Semi-retired transplanted Oregonian. Adjusting to old(er) age and being at home full time. Fairly recent widow.